Kain Slowikowski was born in Baltimore, Maryland and spent summers in nearby Ocean City, which developed his love for the coast, beach lifestyle and surfing. 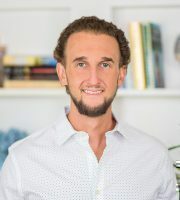 After graduating from Salisbury University with a BA in Psychology with a minor in Business, Kain moved to the Outerbanks of NC to work for his fathers insurance, remediation and storm restoration company as a project manager. There, he was educated on coastal construction, secondary home maintenance, and coastal insurance policies. After years of vacationing here, Kain moved to Folly Beach in 2010, where he continues to live today. The Folly lifestyle allows him time for doing the things he loves: surfing, cooking, exploring the surrounding area, and reclaiming wood from historic Charleston homes to build custom furniture. Kain is a member of the Charleston Trident Association of Realtors, Surfrider Foundation, and Mission Blue.